"Rocking and Rolling in our Community"
Welcome to the 2019 Twilight Invitational Parade. 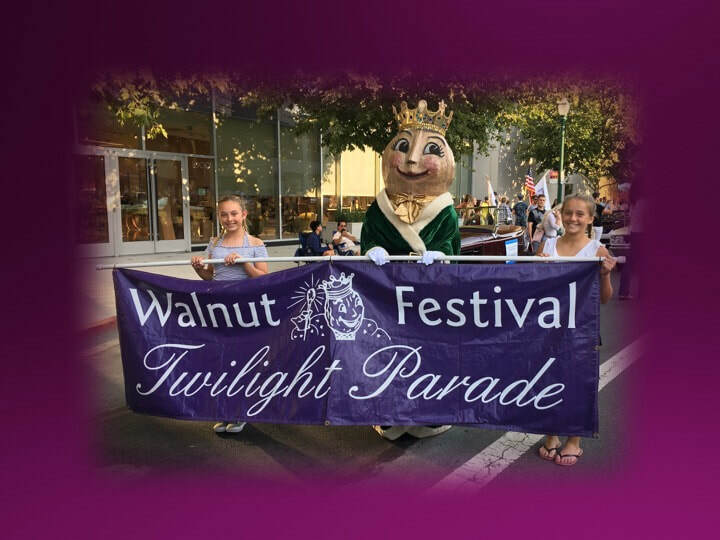 The Walnut Festival Association is excited about this year's parade. As you know, our theme this year is "83 Years - Rocking and Rolling in our Community". Our participants represent a variety of schools, businesses, non-profit groups from our local communities. The Pacific Coast Judges Association will be judging the parade. After the results are tallied, the band awards will be announced at the gazebo in Civic Park. Trophies will be given out that evening and monetary awards will be mailed. Band Directors. Please pick-up PCJA comments and score sheets (during the gazebo award presentation). The Judges reviewing stand area will be on the right side at Main and Civic in front of Police Department. Cheer/Dance teams wishing to have a CD played during judging, please bring the CD in your own boom-box to the announcer at the reviewing stand, prior to the parade. Cheer competitors, martial arts groups or any other group performing in the parade, will need to keep the time in front of the judges to two (2) minutes or less. This rule also applies to all groups that might be performing for the judges. Failure to limit performing time will result in disqualification. There will be heavy traffic in downtown Walnut Creek and the staging. Some streets along parade route will be closed to all traffic from 4:00 pm to 10:00 pm. All vehicles being used in the parade must be on the parade route by 5:15 pm. This is for the safety of the hundreds of people who will be in the staging area. Please park your vehicle in the correct position as outlined on the map. Buses should plan to drop off students behind the Broadway Plaza parking structure. The buses can then go the DMV parking lot located on Broadway to wait. In order to get your parade vehicle into the staging area, you must use the vehicle pass (emailed to participants). It is to be placed on the left side (driver's side) of the dash. The Walnut Creek Police will not let your vehicle into the staging area without the pass. Walnut Festival Staff will be wearing orange/yellow vests. Please contact them if you have a question. Check in will be at the corner of Olympic and S Main Street. The table will be open at 4:00 pm. Please send one (1) person to check in table and obtain your parade number(s). All units must be in position by 5:45 pm. There will be no exceptions. In order to keep the parade flowing and to maintain a safe distance behind the group ahead, there will be section captains assisting you along the parade route. WALKING GROUPS will be directed to turn right towards Civic Park. Walnut Creek Police Department requires that all people follow traffic rules and use street crosswalks when crossing. Broadway is not closed to vehicle traffic. Follow the instructions of the parade officials and the Walnut Creek Police Department. VEHICLES you will be directed by a section captain to proceed straight. You may want to use the parking garage on Locust, as this garage is near the end of the parade route. We appreciate all the time and effort that you have put in to make this the best ever Twilight parade! Please fill out the application prior to September 1, 2019 to secure your spot in this years parade.